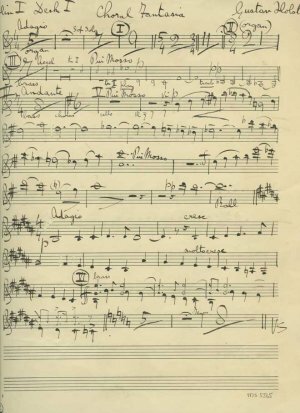 Description	 MS in English on paper, Gloucester, 1931, 3 pp 31x23 cm written in single and double staff notation, with corrections and multiple cues for the organ and other orchestral and choir parts, titled "Choral Fantasia, Violin I, Desk I", autograph, signed. Context	 Gustav Holst (1874-1934) wrote A Choral Fantasia in 1930 for the Three Choirs Festival to be performed in Gloucester Cathedral with a substantial organ part at the request of the Cathedral's organist Herbert Sumison. Holst conducted at the premiere on 8 September 1931. 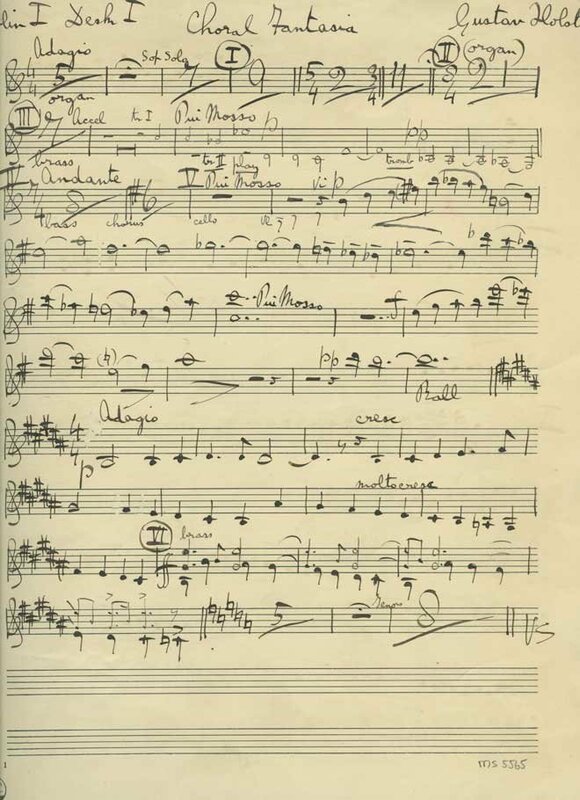 The music starts with a fortissimo ascent up a Phrygian scale, about which one music critic from the Observer wrote: "When Holst begins his new Choral Fantasia on a six four of G and a C-sharp below that, with an air of take it or leave it, one is inclined to leave it". Provenance	 1. Christie's 6.6.2006:4072; 2. Musikantiquariat Dr. Ulrich Drüner, Stuttgart, December 2015. Commentary	 This first violin part evidently precedes the first edition published in London by Curwen in 1931. It differs from a normal printed edition by an unusual amount of cue notes. These are extremely helpful for musicians when performing a hitherto unknown and unperformed work. For a professional copyist it is extremely difficult and next to impossible to sort out of a highly complicated score of a yet unknown work, the incisive motives, which are the most adequate materials for cue notes. Therefore Holst wrote himself the first violin part. 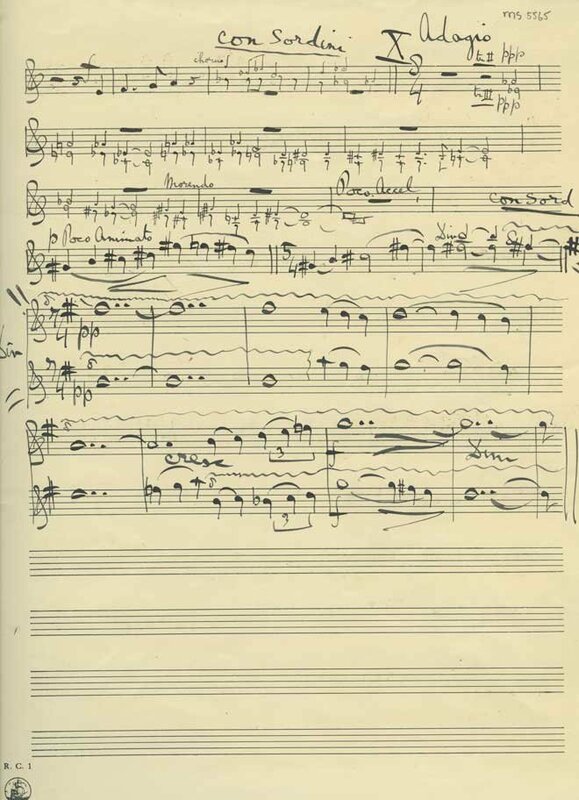 In this respect the present MS is a nearly unique source documenting the practical process from a first - yet unperformed - score to the first performance of a new work, due to the fact such handwritten materials are usually discarded upon publication of more readable printed parts.